Research shows that more than a third of UK employees lack the confidence to ask for a pay rise. A quarter fear asking their line manager for time off that they are owed. More than a third are afraid to put their own ideas forward in client meetings or with a superior. One in five consider themselves to be a pushover. 20% have missed out on a promotion because they lack confidence in their abilities. It sounds like the British workforce has a real confidence problem that isn’t doing them any favours. But while some are naturally more confident than others, confidence is something you can learn and improve on. Here are the top five courses to help you build your professional confidence, take control of your career path, and become better at your job. Course leader: Dr Ajay Khandelwal PhD is a psychoanalyst with extensive experience working with the Civil Service. He specialises in working with successful professionals who are experiencing difficulties in their careers and looking for opportunities to develop. Work in the public sector and the Civil Service have always been subject to sudden, large scale, and stressful changes. These are often in response to economic, social, and technological shifts, as well as advancements in research. But, when a team is resilient, everyone can be confident they have what it takes to keep producing their best work. This course allows individuals to reflect on how change affects them and how they can better adapt to it in the future. Building new relationships with people can be challenging, especially for those who lack self-confidence or get nervous. In this course, you’ll learn how to communicate effectively with confidence. You’ll be able to present yourself as a reliable, confident figure, and allow people to connect with you instantly. Course leader: Anthony Tasgal has spent the last ten years running POV. It is a strategic brand, communications, and training consultancy specialising in creating ‘insightment’ and storytelling. Stories aren’t only there to entertain. They persuade, and they open the mind to new ideas. They back up arguments, they shock, they impress, and they are an important tool when it comes to confident communication. In this course, you’ll learn how to move beyond data, facts, and information. Instead, you’ll call on your creativity to start crafting stories with a purpose. Course leader: Angela Blacklaw is a business owner and director with extensive experience in providing training for the public sector. It is hard to deny that, historically, women have been pushed into the background when it comes to leadership, and they often still are. In this course, you can become a part of one of the most critical societal changes and learn how to confidently lead as a woman in the workplace. This course takes a practical, honest, and down-to-earth approach in addressing the problems women face in the workplace. It provides tactical insights for successful leadership and management for women. Course leader: Dennis Marcus has extensive experience and knowledge to share when it comes to successful communication, acquired through various roles, including working as a speechwriter for high-profile politicians and business executives. Give yourself the ability to know that you can master any public speaking event or any presentation through this course. 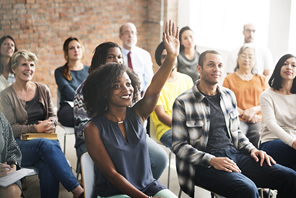 You’ll learn how to perform in different situations, enhance your presentation skills, and get helpful tips on how to improve your public presentation. You’ll learn how to impress a crowd with confidence using your greatest tool - your voice. These are the top five courses available at Civil Service College to help you build more professional confidence. The changes you experience will help you win that promotion, complete your work faster, and build long-lasting business relationships. To get started and sign up to our courses, get in touch with Civil Service College on 020 8069 9000.